announced by Nancy of Nancyrosetta My jewelry is featured as 3-D works/wearable art. I will be doing a jewelry demo or two (with torch) on Saturday. If you are in the Norwood. 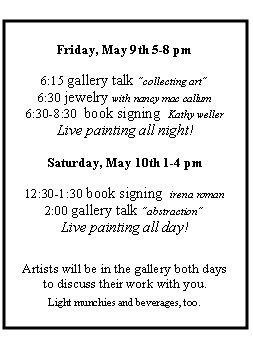 MA area this weekend, please check out the festivities at Custom Art Framing and Gallery 9! There will be live painting all day on Saturday, along with talks and demo's of other mediums.